In the last few years there has been talk about “The Greatest Generation” and the contributions that this World War II cohort made to the USA. In my part of the country, there have been news stories about WWII veterans being able to make a trip to Washington DC to visit the war memorial. I have recently read several works of fiction with a setting during WWII. Consequently, I have had a new interest in this important period of our country’s history. Joyce Magnin’s book Maybelle in Stitches is a story that took place during WWII, part of the Quilts of Love series. It is a book that laid out the seriousness of the war. Not every man who went to fight came home and those who did come home were changed forever. The easy-going prose and the lighthearted book title belie the seriousness of the situation. The book is set in 1943 in a suburb of Philadelphia, centered on women who worked at Sun Ship and Dry Dock, a shipyard that built ships during World War II. Maybelle Kazinski was the main character along with her friends, co-workers and housemates. 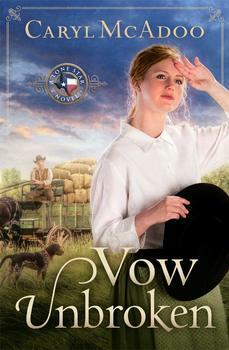 The story centered on wives employed at the shipyard whose husbands were serving overseas. In spite of the uncertainty of life these women did their job and did it well. I enjoyed the camaraderie between the women and how well they assisted and sustained each other through all kinds of life situations. Coping with rationing, blackouts and shortages were a common problem. Maybelle and her friends began working on a quilt that Maybelle’s mother had started. The work helped to draw these women together and they stood by each other through difficult times of death and a husband who was MIA. Maybelle in Stitches is a book that is entertaining along with showcasing what life was like during the period of the Second World War. Magnin also paid tribute to the valuable contribution made by women working in what was once considered “men’s work,” and doing an excellent job. I recommend this book. 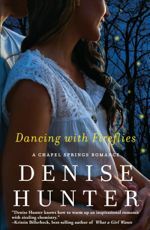 I just finished reading Dancing With Fireflies by Denise Hunter part of the Chapel Springs Romance series and I was just a bit frustrated with the book. Don’t get me wrong – I enjoyed this book. Earlier, I had read Barefoot Summer a previous book in the series and I was familiar with the appealing McKinley family of Chapel Springs, Indiana. Here’s the thing. I really liked the McKinley’s. The protagonist, second daughter Jade was delightful. Almost part of the family Daniel Dawson was a dream-come-true man. I loved reading how the family worked together, helped each other and remained very close. What’s not to like, right? The source of my frustration was in the relationship between Jade and Daniel. By page twelve it was readily apparent that these two belonged together and were in love with each other. The entire book was based on these two trusting each other, loving their time together with Daniel continually reaching out to help Jade. It was so apparent that they belonged together. Now I realize that I had insider information – privileged to be in the minds of both Jade and Daniel; but it seemed to me that if they would just tell each other how they felt this problem could be solved. This book was definitely worth reading. You will wish you were a part of the McKinley family, attending the weekly family meal, having girl’s nights in or out with the McKinley sisters and enjoying life in beautiful, close knit Chapel Springs. I suspect that like me, you will wish that Jade and Daniel could just cut to the chase and become a couple. You are sure to develop an affection for these two characters and will rejoice at the ending. The take-away for me is the importance of honest communication in relationships. So much pain could have been avoided by sharing feelings. Denise Hunter is the internationally published bestselling author of more than 20 books, including "Barefoot Summer" and "The Convenient Groom". She has won The Holt Medallion Award, The Reader's Choice Award, The Foreword Book of the Year Award, and is a RITA finalist. When Denise isn't writing she's busy raising three heroes-in-the making with her husband. If asked, I would have told anyone that I was not interested in time travel stories. I thought the whole topic was ridiculous. New author, Lynne Gentry has written an interesting novel that involved time travel. Healer of Carthage is book one in a new series called The Carthage Chronicles. The book presented some fascinating concepts and ideas. Gentry researched this novel using theological, medical and historical sources. The protagonist, Lizbeth Hastings, fell through a water opening in a cave to third century Carthage. My thoughts as I read the beginning of the book were that her survival instincts were poor. Going into a brand new culture and telling the citizens exactly what she thought of them did not seem exactly prudent. As the book progressed Lizbeth became more likeable and I became hooked on the story. The book is plain about the problems in the Roman Empire during this time period. Christians were persecuted severely and the poor were treated abysmally. Lizbeth, a 21st century first year medical resident, found herself known as “a healer” in 3rd century Carthage where she found herself fighting a plague. I liked watching the changes in Lizbeth as she settled in to her new life, fell in love with a Christian aristocrat and got married. The part that really interested me was how she learned to love her new life. I wondered how many of us would feel more at home in a previous century. It is an interesting idea. My one complaint would be that the book ended in a situation where I definitely wanted it to go on. The publisher has included the first chapter of the second volume in the series and I do plan on reading it; but I have many unanswered questions. I recommend this book. I know when I want to read volume two; volume one was a good book. This girl who grew up on a Kansas dairy farm never wanted to be a writer, but she has always been a storyteller. Her mother called it "Selling wind in a bag." Lynne started out writing plays and skits. Then in a moment of sheer insanity, she decided to take a stab at writing full-length novels. Reinventing Leona was her first and it is no longer in print. 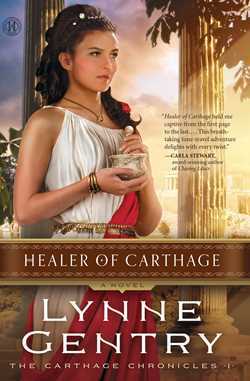 Healer of Carthage is her latest novel, releasing March 2014. Lynne can milk a cow, drive a tractor, organize a banquet, prepare a kid for that first professional acting audition, or sit across the table and enjoy a cup of coffee with you. She counts her thirty-plus year marriage and her two wonderful children as her greatest accomplishment. There have been many books written about the events that occurred during the week between Palm Sunday and Easter Sunday. I have just finished reading one that has affected me profoundly. The Thief by Stephanie Landsem, is book two in her Living Water series. The story is written with the viewpoints of two very different protagonists. Nissa, is a poor Jewish woman and Longginus, a Roman centurion. Their parallel lives are inextricably linked and tell the story of the last days of Jesus in Jerusalem. In the end, their lives come together dramatically. Landsem does many things well. First of all, this is an excellent story, meticulously researched and builds up to the climatic finish. I did not want to put the book down. Also, Landsem uses sensory rich prose to give the reader a view into the life of the underclass in Jerusalem. In Nissa’s neighborhood I could smell the vile odor from the tannery. I was able to feel Nissa’s hunger pangs. I could sense her exhaustion as she carried her heavy water pitcher home. The contrast with the lives of the elite religious class was striking. It gave me a new perception of the poor people that Jesus ministered to and the arrogant wealthy and uncaring religious scholars. The author also showed through the character of the Roman centurion how subjective the rules were for this class – how easy it was to fall out of favor. Longginus was a good man. He gave up everything for trying to do what was right. Landsem also has been able to describe the suffering of Jesus in a way that has affected me forever. We become so accustomed to the story of Calvary and what Jesus has done for us. This book gave me a new gratefulness and a new understanding. I recommend this book to be read before Holy Week. It is a powerful story of redemption and it gave me a new appreciation for what Jesus did for me. Find out more about Stephanie at http://www.stephanielandsem.com. It Had to be You by Susan May Warren is the first volume of a new series about the Christiansen family. The book includes a prequel for free. This novel is set in Minnesota, both the Twin Cities and a town Warren calls Deep Haven on the North Shore. As I live in Minnesota this interested me and I felt that Warren does an excellent job showcasing this beautiful state. If you are a reader who enjoys athletics – especially hockey, Minnesota’s favorite past time – this will be an enjoyable book. Warren gave a glimpse into the world of the NHL that is not pretty. She also touched on football and track, showing how one wrong move really changes the life of an athlete. This is not a book just for sports fans, however. It is a love story and – spoiler alert – it is a book that will probably make the reader cry. Warren illustrated well what happened when one person becomes too responsible for another. As a parent, I felt that through fiction, the author was able to dish out some excellent advice. It is good lesson for anyone too invested in another person. Warren’s characters are presented honestly, showing all the warts and blemishes; but still revealed the goodness that is there when individuals invite Jesus into their lives. I fell in love with the Christiansen family – Mom, Dad and six kids – and I look forward to additional books in the series. They were one of those families that made me not want to say goodbye. Single Dad, Sam also worked his way into my heart. The author also knew her way around the transplant center and Children’s Hospital at the University of Minnesota. This portion of the book also gave the reader much to think about. Warren touched on topics loved ones surely go through like fearing an organ will not be available and researching ideas like how to buy an organ. There is much to like and enjoy and also much to think about in It Had to be You. I recommend this book and as stated am looking forward to additional volumes in the series. I received this book from the publisher in exchange for a review. All opinions expressed are my own.